So I rocked out a hold on a DME fix about 18 miles sooutheast of Flint, then went in for the ILS 27, the RNAV 18, the ILS 27 again, and the VOR 18 before landing and switching pilots. 2.0 ASEL high-performance and 1.6 of it under the hood. We had some VFR traffic around NUPUE, my intended IAF, and I volunteered to be vectored to JUBER instead, so there was some fast fingerwork on the G1000. But no worries. Not one of my better landings. I came in a little hot and then found myself trying to bleed off the airspeed in the flare. Not good, because C-182s bleed off energy up to a point, then they like to drop (sometimes nosewheel first). I bounced on the mains once. Not high, mind you, but a bounce in a C-182 is not something to let develop into a porpoise. So I gave her a bunch of gas, made flying speed again, then lowered her back onto the pavement. I debriefed that one and concluded, Blue-Angels-style, “I’ll fix my safeties and I’m glad to be here.” I still have some way to go to be C-172-comfortable landing a C-182. I decided that much closer management of airspeed over the fence would be the key next time. Capt Malek took over the left seat and flew a beautiful RNAV 18 with a mid-stream change of IAF to FIBIN from NUPUE due in part to a misunderstanding by approach as to the side from which we wanted to start. No problem though. We’re good with fingerwork. Back at KPTK, Capt Malek shot the ILS 9R, then executed a beautiful crosswind landing on 27R with a crosswind approaching CAP maximum of 15 knots directly across the runway. We invited 1Lt Scott Gilliland along to ride in the back seat. 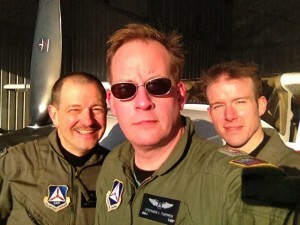 Scott has been a CAP VFR Form 5-ed pilot in the round C-172, but has never flown in a C-182. He’s also not the usual CAP fat guy and he therefore fit well within the C-182′s 3,100-lb MTOW (and, more importantly, 2,950-lb maximum landing weight). With the recent jockeying of aircraft in the wing, most of the CAP C-172s are fairly distant from where we live, leaving this glass C-182 and a Gippsland GA-8 AirVan as the closest two. Thus, Scott has some incentive to become as familiar as possible with the C-182. We did our best to show him the wonders of the G1000 and we avoided looking too confused. This flight was my first spring rust-removal flight, so it takes a certain willingness to screw up in front of an audience if you’re going to bring an FNG (or even a pilot with CAP experience like Scott) along for the ride. Fortunately, I’ve never had a problem sharing my learning curve with others. And Capt Malek is just a good stick. So I think that we gave Scott a reasonable demonstration of a CAP aircrew in action. Tim Brutsche of The Hoppers once told me that it’s a sin to fly an aircraft with an empty hole. As with other things, Tim is right. If you have the opportunity to share the experience, you ought to. This is especially important when you’re trying to build the aircrew roster with conscientious and skilled pilots like Scott, who lacks only a few endorsements and some time before wringing out this aircraft himself. It’s about aircrew. Getting up on a day when there are other things to do, but knowing that knocking out approaches is an important thing for currency, proficiency, and aircrew readiness. Sharing the experience with others in the pipeline. Taking the opportunity to put eyeballs, hands, and feet to hard-won and perishable uses. This is the very best of what general aviation has to offer. And I’m privileged to have spent an afternoon up in the air with this aircrew. I’ll fix my safeties and I’m glad to be here. Cool poststript: Once we had the aircraft back in the hangar and buttoned up, Scott gave us each a dollar. I’m not sure that a ride like this really counts as a dollar ride, but I’m a huge fan of the tradition and I accepted mine with great pride. I think that this aircrew will be turning those dollars into tasty beverages soon. More importantly, give that empty seat to a CAP cadet and NOT another adult. What a better way to introduce the young aspiring pilot! We need to do such so bad and this is a perfect opportunity. I cannot understand why CAP does not understand this and why CAP has not promoted this opportunity. The CAP flights here seem to fly the adults and NOT the aspiring aviator.